This week there was heated discussion about the toddler who was twice run over by a van and not helped by passersby and people around until a rubbish-collecting woman picked her up (read here). Below is this week’s offer about the continued Weibo activism to free Chen Guangcheng; what are “socialist core values”; China’s luxurious prisons for jailed officials; and more. Click on the date under the item for link to the original. Lu Qiu Lu-wei/闾丘露薇/Journalist with ifeng TV, Hong Kong/: My book-signing and lecture tour in three Northeastern cities has come to an end. A young female reader asked me to write “Give Light to Guangcheng” on her copy. In Shenyang, about ten readers asked me to write “I want Guang (light), I want Cheng (honesty)”. Today in Dalian, a man came to the bookstore and asked me to tell him all about Chen Guangcheng. This afternoon in Dalian Foreign Language College, several dozens of students asked me to write “I want Guang (light), I want Cheng (honesty)”. More and more people are asking: Why? 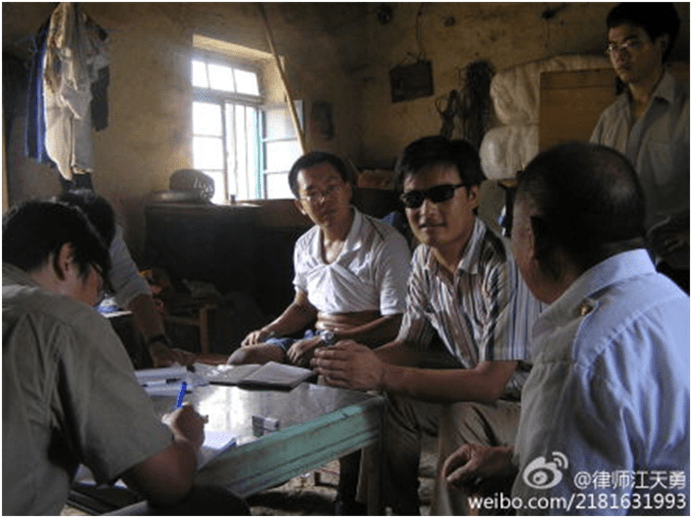 Chen Guangcheng (陈光诚，with sunglasses) and Teng Biao (滕彪，a lawyer) talking to victims of violent implementation of family planning policies in June 2005. 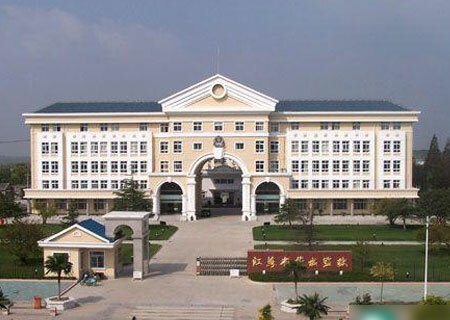 Zhang Ming / 张鸣 /(Professor of Political Science at People’s University of China): Today I received a call from someone with the Party Committee of the School [of International Studies]. He asked me not to say anything more about Chen Guangcheng, and he said this was per instructions from the School. I asked, “Why?” He said he was merely passing on the words. This is the first time the School tries to interfere with my online activities, and I hope they will not do it again. Zhou Shuheng /周述恒 /(Author of Chinese-Style Laborers (《中国式民工》)/: China is holding “2011 Chinese Film Week” in New York right now. Despite lavish promotion, there was not a single audience when “The Founding of a Republic” (《建国大业》) was shown in Walter Reade Theatre in Lincoln Center on the 17th, the opening day.Not even a soul from the sponsors. It’s a joke now among the Chinese media here. These con artists so underestimated the IQ of people in the free world that they deserve to lose their face and money! Wu Zuolai / 吴祚来 /(critic, scholar)/ : Zhang Zhaozhong killed Saddam, ruined Mubarak, and now he killed Gaddafi too. Without leaving his house, a Chinese military researcher accomplished the task the Americans assigned him. What amazing military wisdom! Sun Tzu (ancient Chinese military general, strategist and philosopher, author of Art of War) says, the way to kill the leader of the opposing side is to hail him, exalt him, and admire him, until you ballyhoo him to death. Zhang Zhaozhong ballyhooed all of them to death. By T in Uncategorized on October 22, 2011 . 美丽，I am so glad you, hopefully others too, find it useful. I hope you had fun with the Chinese-general-taking-order-from-the-Americans-killed-Gaddafi-by-ballyhooing-him-to-death joke. There isn’t a word for me to describe the significance of Weibo to China, even though posts are still regularly deleted. It is plain clear that the deletion can’t possibly catch up with the postings and re-postings. It’s a similar tool as Twitter, but for a country like China where basic freedoms are still lacking, Weibo, as one commentator said, is tantamount to freedom of press. And it is bubbling right under the hard shell of People’s Daily and CCTV, and it is the source of real news these days, for better or worse. I feel strongly about offering our audience this weekly sampling on Tom’s blog. Thanks, 美丽，as always. Thanks, Tom, for letting me do this. Yanxue, Keep it up! BTW, China Media Project website has a little more of the central committee communique. Reading that piece of dribble, i defy anyone to explain what the author is talking about. It reminds me of the student, asked to write an essay on a subject about which he knows nothing and must stretch it to 1000 words. Perhaps the party cannot explain socialist values because none exist. Sorry, Yaxue not Yanxue. My bad. No problem 🙂 No spelling nazi here. A few years ago I was contacted for a job similar to the China Media Project. When it didn’t work out, I was rather relieved: Translating the Party’s Communiques and People’s Daily editorials and the like can cause serious brain damage–seriously.